Traverse City’s amazing food scene is synonymous with the farm-to-table movement. And there’s no doubt that a meal featuring a first course of beet salad with fennel, pine nuts, citrus and feta crumbles, and a second course of pan-seared Atlantic salmon filet with maple glaze, is a delectable treat. But sometimes you just need a slice of crunchy, cheesy, perfectly-sauced deliciousness. When you’re hungry and need a bit of comfort on a cold eventing, there’s nothing better than a great pizza. And there’s no better place to grab a great slice than Traverse City. (Okay, I know Chicago and New York may beg to differ, but who really wants to deal with the long lines and high price tags, right?) 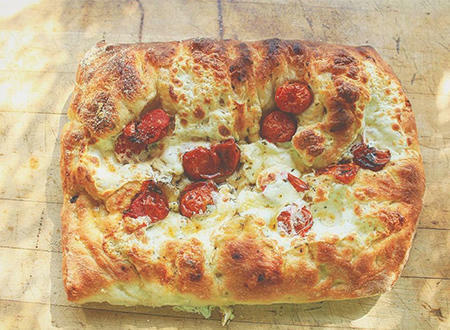 From thin-crust to thick-crust, traditional to unconventional, Traverse City’s pizzerias are serving up delicious and imaginative pies that satisfy every preference and palette. The Filling Station is a family-friendly eatery that offers scrumptious flatbread pizzas and salads, as well as house-brewed beers. The pizzas feature fresh ingredients made from scratch and are cooked in a wood-fired oven at 700 degrees, which means that they come out fast and with an extra-crispy crust. If the weather is nice, you can eat outside along the train tracks and the kids can play in one of the sandboxes located on the patio. The Wolverine is our favorite pizza. 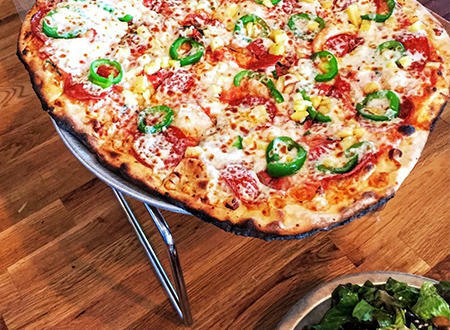 It’s topped with pepperoni, fresh pineapple and jalapeno peppers. Fear, not MSU fans - there’s a Spartan pizza, too! 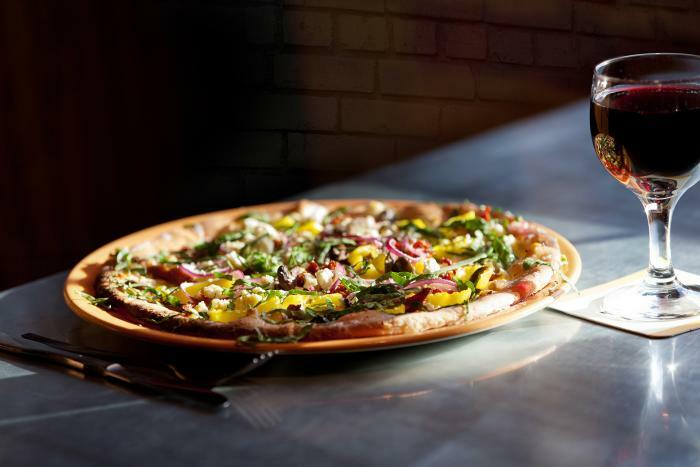 Pangea’s is a fun, cozy spot to grab a hand-tossed pizza brimming with creative toppings and a local craft beer in downtown Traverse City. Pangea’s also offers a broad menu of sandwiches and salads. One of our favorite specialty pizzas from here is the African Blue, which is topped with chicken, roasted yams, red onions, blue cheese, and a tangy BBQ sauce. I’m getting hungry just thinking about it! You can also add a flavored crust to any pizza, including garlic butter, cajun, jerk, parmesan or sesame seed. Given its convenient Front Street location, Pangea’s is a great option for lunch or dinner if you’re downtown shopping or strolling. Trattoria Stella, which dishes up amazing Italian farm-to-table food, may not be the first place that comes to mind when you&apos;re looking for pizza, but it’s near the top of our list. Stella offers only two pizza styles, a “Red” and a “White,” and its prioritization of quality over quantity pays off as the product is consistently excellent. Red, topped with cheese, sausage and soppressata, and White, topped with cheese and garlic, are both thin-crust pizzas that come out of the wood-fired oven crispy with slightly charred edges. The restaurant&apos;s broader menu is a bit on the pricey side - although worth every penny in our opinion - but the pizzas are very reasonable and offer a budget-conscious way to indulge in the Stella experience. We love grabbing a seat at the bar and ordering a Red style pizza and a couple of Stellar Ale beers, a Pale Ale made by Short’s Brewing Company that&apos;s available on tap. Like Stella, Pleasanton Bakery is located in The Village at Grand Traverse Commons. Their pizzas are cooked in a wood-fired brick oven (notice a theme here? ), and the pizza menu changes with the season based on the availability of fresh, local ingredients. Right now we’re loving the Chicken Pesto, which features kalamata olives, parmesan, Michigan cheddar and roasted cherry tomatoes. Pies can be ordered Wednesday-Saturday from 5-9 p.m.
We used to live in Chicago, so we still have an affinity for thick, gooey, deep-dish pizza. Chicago-style pizza is hard to find in Traverse City, but one place that does it right is Paesano’s on East Front Street. Paesano’s, which has been a fixture of the Traverse City pizza scene for decades, makes dough from scratch and tops its pizza with a wide variety of fresh ingredients. Our kids love enjoying a Paesano’s pizza, straight out of the oven, in a warm and cozy dining room that makes you feel like you’re indulging in an authentic pizza parlor experience.